I love John Lewis, the British department store. It’s always a delight to shop there, with its wide range of stock, attractive stores and superb customer service. And it’s so convenient to shop online at johnlewis.com, paying with PayPal, then collect the goods at my local Waitrose. I experienced that terrific customer service again today. 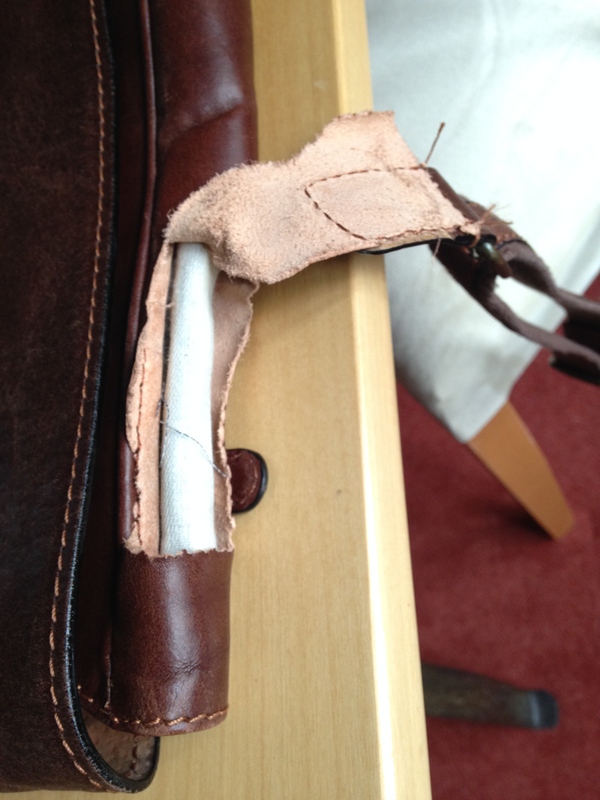 I was distraught recently when my John Lewis messenger bag ripped (below) when it snagged on the side of the car seat. I’ve had the bag since Christmas 2012, and found it perfect for trips into London when I didn’t need my laptop – this bag has room for iPad, wallet, mobile phone and EE mifi. John Lewis in Watford swapped the faulty one for a new one without quibble despite the fact I didn’t have the receipt. No wonder John Lewis’s business results are so strong. This entry was posted in Business and tagged John Lewis by Rob Skinner. Bookmark the permalink. You’re right that John Lewis/Waitrose customer service is exemplary. I could take some cheap shot and make some comparisons to PayPal customer service but I know you’ve likely heard it all before. What’s heartening though is that a senior member of the PayPal team notices good customer service when they experience. I hope you will be able to take some of that ethos back within PayPal. My view is that Ebay – and by extension PayPal – really need to get a handle on satisfying basic customer service demands first. PayPal has certainly improved in recent years and everyone you speak to on the frontiline in Dublin is very pleasant, although rarely able to resolve an issue themselves (which must be frustrating for them too). The ‘customer service’ personnel I have spoken with at Ebay on the other hand are generally quite arrogant, often brusque and on some occasions downright rude. I know both entities provide more human client relationships at a B2B level but I’m the corporate world as a whole also knows Ebay/PayPal customer service has a reputation for leaving a lot to be desired. Google and Facebook are also difficult to deal from a small customer perspective and brat-like customer service seems to be almost a symptom of how fast these companies have become large corporates. In company terms they are all spotty, pubescent, uncommunicative teenagers that know less than they think about the world they are operating within. As a customer, I’d be reluctant to let Ebay/PayPal into any sort of meaningful three-way relationship between me and any retailer with such exemplary customer service as John Lewise/Waitrose. I do hope, however, that over time Ebay and PayPal grow to respect and care for ALL of their customers in the way that John Lewis does. I appreciate given your position you probably can’t reply to my points directly but your blog post made for an interesting starting point for a discussion. Paul – thanks for the comment, as always. I respect your comments as always but I’d also point out that PayPal makes it easier to shop online, especially on a smartphone, by taking away the need to enter long credit card numbers, and without sharing sensitive personal and financial information with others.